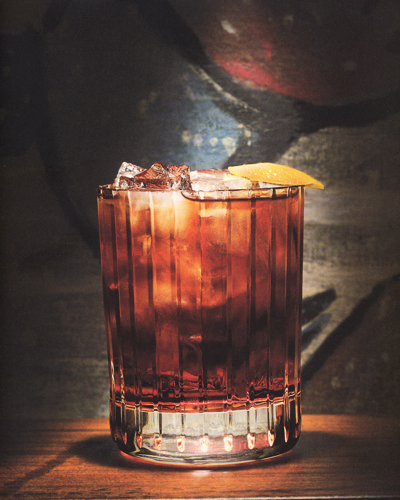 It’s almost impossible to get a good Negroni in Italy. 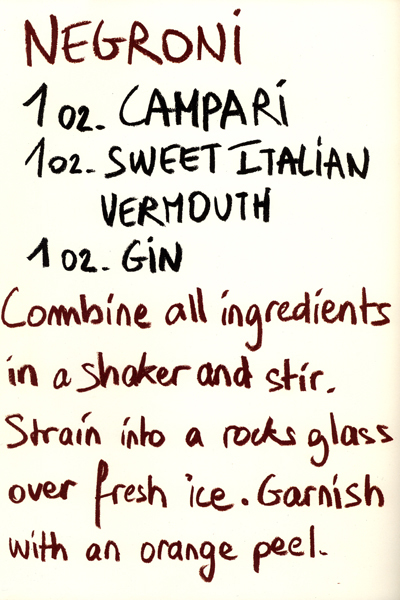 Which shouldn’t be the case since this formidable drink was invented by an Italian count, one Camillo Negroni, in Florence in 1919 at the Caffè Casoni. The story goes that Count Negroni asked the bartender to spike his usual cocktail, the Americano, by adding gin rather than the normal soda water (an Americano, created in the 1860s, being made of Campari, sweet vermouth, and club soda, was also the first drink ordered by James Bond in the first novel in the Ian Fleming’s series, Casino Royale). Anyway, it’s really difficult to get a decent Negroni in Italy, mostly because the Italians, in general, don’t drink gin so what you get at the typical bar is some vile-smelling stuff that is immediately off-putting. But, oddly enough, I had a fabulous Negoni the other day at La Tentation, a swank restaurant and bar next to the women’s market in Port Vila on the island of Efate in Vanuatu. The bartender/manager, Nick Smelik, used to be an event planner for the likes of Yves St. Laurent and Princess Anne, and, I guess, somewhere along the line he learned the advantages of using top-notch booze in his cocktails, for the Negroni I had here was one of the finest I’ve ever had. Mind you, I was both famished and parched—the perfect circumstances for ordering this libation which, because of its complex sweet-bitter taste is really best ordered as an aperitif (and because of its kick, you only get one). I couldn’t agree more. I only wish I knew how to quit them. A Vanuatu sand painting of a butterfly. Photo by David Lansing. Sand painting, the art of drawing mostly symbolic symbols, usually with a single finger, in dirt or sand or ashes, has been practiced on just about every continent for thousands of years. 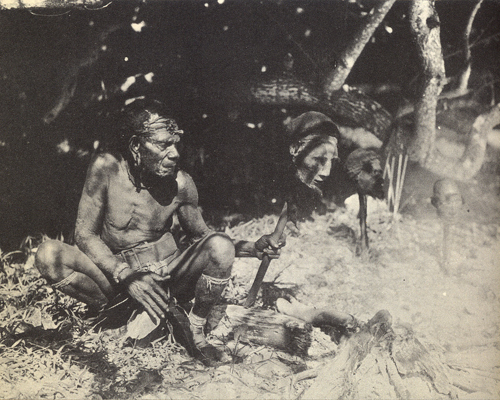 Southwestern Native American (mostly the Navajo) use naturally colored sand as well as corn meal, flower pollen, and powdered roots and bark, to make ritualistic paintings on the ground of a hogan, their sacred lodges that serve much the same function as the nakamal to the ni-Vans in Vanuatu. Tibetan monks compose mandalas of colored powders as a teaching tool and metaphor for the impermanence of life since the drawing, which may take several days to finish, is destroyed almost immediately after completion. Indigenous Australian Aborigine have been practicing sand painting for thousands of years as a way to record history and tell stories. After drinking our kava in the Vil-Vil nakamal, a young man spread a bowl of ash onto the dirt floor of the long house, smoothed it with a brush made of reeds, and then quickly, using just his index finger, began drawing elaborate designs, first of a turtle and then of a butterfly. They weren’t as complex or as artistic as I’ve seen, but, in their hieroglyphic simplicity were beautiful none-the-less. The turtle in Melanesian culture often represents steadfastness and long life while the butterfly is a symbol of fertility and death-and-rebirth mythology. I don’t know, maybe I’m over-thinking this, but when I looked at the butterfly the villager had drawn in the ashes of the cold fire, the first thing I saw was the ancient symbol for infinity—sort of a figure 8 on its side. But maybe that’s just me. 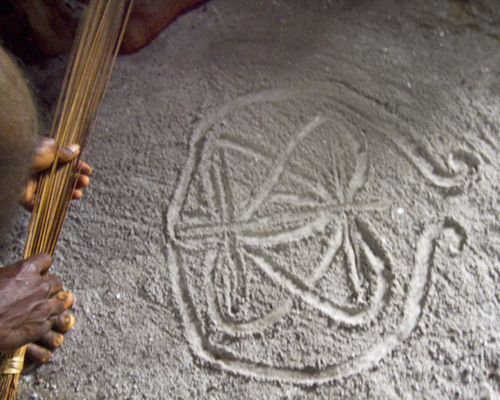 Anyway, take a look at this video of a turtle sand drawing in Vanuatu and tell me this isn’t based on a series of infinity signs. “Late in the afternoon, Martin and I walked a little way from the village talking over the best method of taking leave of our strange host. We strayed farther than we realized, and came upon a much traveled path leading to the tiny doorway of an unusually large hut. Always curious, Martin got down on his hands and knees, peered in and entered. I followed. As my eyes gradually became adjusted to the dim light I saw what looked like baskets of black grapefruit. I picked one up to examine it more closely and dropped it in horror. “It was a dried human head! A Martin Johnson photo captioned "Campfire of the headhunters"
The most important building in any village in Vanuatu is the nakamal, a sort of men’s clubhouse. Sometimes it’s just the place where the men meet at the end of the day to talk and drink kava (sort of a South Seas sports bar), but for ni-Vanuatu who truly follow their cultural heritage, as they do in Vil-Vil, it’s also part school and part church. After the men of the village had done a few songs and dances for us, I sat down with Chief Bule Kone and we traded off asking each other questions. I asked him how often he visited Luganville, the largest town on Espiritu Santo and a good three hour drive away. “Maybe two time…maybe three, “ he said. Then he asked me what church I belonged to. I told him that, sadly, I didn’t go to church. “A year?” he asked me. What I was really curious about was how they educated the children in the village. Obviously there was no bus coming by bright and early in the morning to pick the kids up who lived in the jungle. “I will explain it to you,” he said, leading me to a long, low-slung building with a low, narrow door and thatched roof—the nakamal. Inside, I had to stand motionless for a moment to let my eyes adjust to the darkness. There were a couple of rudimentary louvered windows on one end of the house but they were closed to keep out the tropical sun. Other than that, the only light came from what spilled in through the doorway. Against the walls were a series of low bunks, made from bamboo poles, topped with thin bedding. The top bunks were covered in green mosquito netting which could be lowered to cover the bottom bunk as well. In a corner some bricks had been stacked in a square and in the middle, a small fire was smoking and smoldering. Scattered about the dirt floor were some tin pots and pans, sandals, and a plastic tub for washing. This is how we teach our children, Bule Kone said, spreading his arms about. When the boys—and only the boys—are 14 or 15, they must come here to live and take care of themselves, cook their own food. And in the afternoon, the elders come in and make up a batch of kava and everyone sits around talking about god and learning all the rituals that are still practiced and that keep the village together. While Bule Kone was explaining this to me, one of the young men was shredding a kava root the size of a stock of corn into a hollowed-out log. 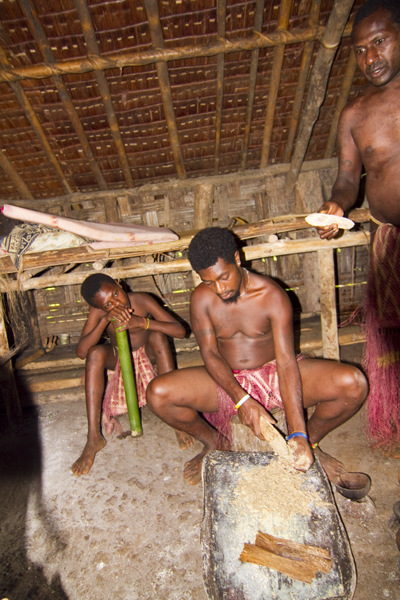 Villager shreds kava from a root like the one Chief Bule Kone, right, holds. Photo by David Lansing. The shredded root was mixed with water and filtered through coconut fibres, then poured into a coconut shell bowl which was handed to the chief. He drank it silently in a single gulp. Then a second bowl was prepared and handed to me. I did likewise, the muddy liquid tasting pungent and peppery. Everyone else followed. And then I had a second round, my feeling being you can never get too much education. “Early the next morning we were once more on our way into the Big Numbers territory. Martin pressed my hand. We were both thinking of that other time. Today there were thirty-one of us. Four white men, twenty-six trustworthy natives and myself, all armed with repeating rifles and automatic pistols. We anticipated no trouble, but our boys were skeptical of the worth of our optimism and plainly frightened by these notorious cannibals. Our carriers held back when we reached the beach. They feared ambush in the jungle. The girls of Vil-Vil. Photo by David Lansing. I’ve done enough of these touristy “let’s-go-visit-a-native-village” trips to be leery. What you usually get is some Disneyfied group of locals dressed up in costumes they normally wouldn’t be caught dead in who then perform a few dances and sing a few songs before bringing out the trinkets they hope you’ll buy. But the village of Vil-Vil was different. First of all, this was no tarted up tourist attraction. It was a few rudimentary shacks made from bamboo poles and rough-cut coco wood with thatched huts spread out around a cleared space in the jungle that was half mud and half grass. 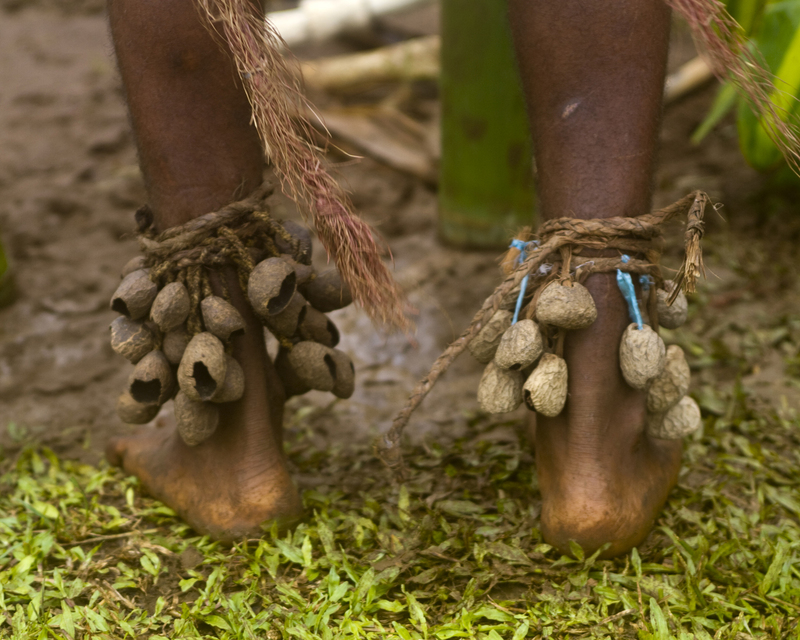 On the parameters of the village were little garden plots for cultivating a few banana trees, pawpaws, and patches of piper methysticum—better known as kava. When we finally arrived, in a light drizzle, there were no guitar players strumming Isa Lei, as you’d get in Fiji, or winsome lasses in coconut bras stringing plumeria leis over our heads, ala Hawaii. In fact, about the only activity I noted when I crawled out of the van, seasick from our tortuous ride, was that of the jungle chickens picking at the grass for insects. And then suddenly a handsome, smiling man, barefoot and bare-chested, wearing a dyed-grass loincloth and ankle rattles, called vivangs, came out of one of the huts to greet us. This was the chief of the village, Bule Kone. Chief Bule Kone's ankle rattles, called vivangs. Photo by David Lansing. I liked Bule Kone immediately. He was both inquisitive about where we were from (“Ah…America. We like America very much. We still remember from the War when you came to protect our islands.”) and straightforward and open about explaining his culture (when I told him I’d read that young ni-Vanuatu girls have no say in who they marry, he smiled and said, “Yes, in our village, this is the custom”). Then several young men came out of the village long house, known as the nakamal, the men’s-only lodge where village adolescents spend their teen years learning culture and religion (and how to be enlightened through kava), and there was some dancing in the mud and beating of the boo-boos, as Osa Johnson called them, and singing, all of it a bit insipid. Half way through the butterfly dance, I wandered off and started taking photos of three little girls who were radiantly beautiful and so shy it almost broke my heart. The rain started to come down a little harder but the men went on stomping their feet in the mud, their vivangs rattling around their ankles, the drummers rhythmically pounding hollow logs with sticks. The whole thing was both fascinating and dispiriting to me and, even still, I’m not sure I could tell you why. Only that it made me uncomfortable. Frederick arranged for us to visit a village this morning of native Pentecost who live inland on Espiritu Sancto in the rain shadow of Mount Tabwemasana. His only concern was that we get an early start since the weather report has it that another tropical storm is due to hit in the afternoon. The plan was to leave Ratua by eight since the trip involved a 30-minute boat ride followed by an arduous trek up a muddy, rutted road that might take as long as three hours. But, of course, when you’re doing something like this with five or six other people there is always going to be someone who sleeps in or just can’t be counted on to be on time, which is why it was after nine before we pushed off. For most of the trip we bumped along at five or ten miles per hour, the young driver maneuvering the rusted van, its shocks and suspension long gone, between pot holes the size of bathtubs, most filled with rain water so you didn’t know how deep they were unless you hit them, and boulders growing out of the ground like pumpkins. Some of the land had been cleared of trees and cattle roamed freely, munching on thick green grass, but mostly it was jungle. Banyan trees, with ancient roots reaching down for the ground from limbs thirty-feet high, rose like skyscrapers above the palms and other tropical trees, some with pale yellow orchids growing on them. Everywhere were breadfruit and pawpaw and Tahitian chestnuts; we also passed by soursop, avocado, and guava trees, all with fruit so thick it littered the ground and gave off a sweet, rotting smell as we passed. There is so much food growing wild on this island—from jungle cabbage to bananas—that it seems it would be almost impossible to starve. Indeed, I’d read that, at most, a village might cultivate a few pawpaw trees or maybe breadfruit a short distance from the village but for the most part children playing would, at the end of the day, casually grab a handful of coconuts or jungle cabbage or whatever they came across and bring it home for supper. 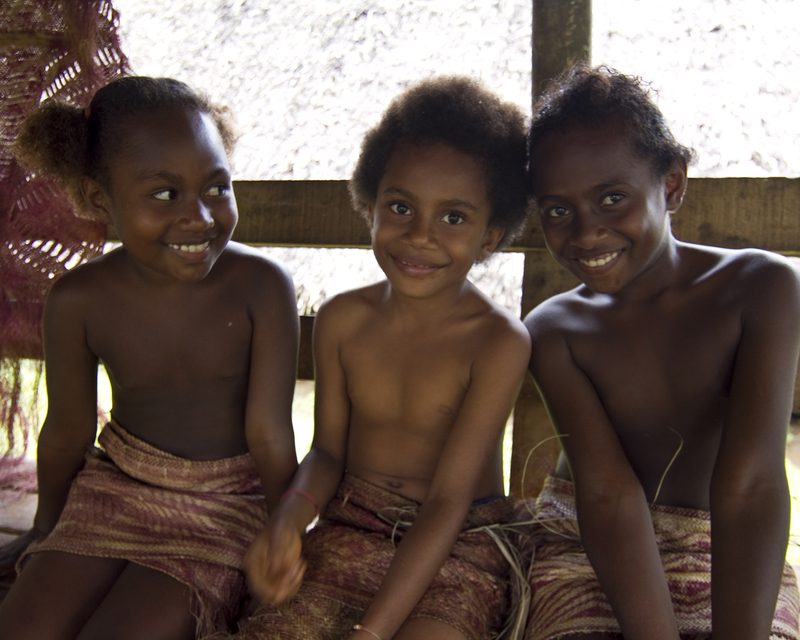 Perhaps that explains their love for laplap, Vanuatu’s national dish, which is any sort of mixture of manioc or taro roots or yams or pumpkin or anything else that is available that is then grated and turned into a doughy paste. It’s like chili—everyone puts something different into it and everyone thinks their version is the best. But in Vanuatu, the trick is that you just make it from whatever is at hand, as this video shows.